NASA’s Orion spacecraft will carry astronauts further into space than ever before using a module based on Europe’s Automated Transfer Vehicles (ATV). ATV’s distinctive four-wing solar array is recognisable in this concept. The ATV-derived service module, sitting directly below Orion’s crew capsule, will provide propulsion, power, thermal control, as well as supplying water and gas to the astronauts in the habitable module. With President Barack Obama taking the oath of office to begin his second term today, it kicks off four more years for NASA to pursue its audacious goal of sending astronauts farther into deep space than ever before. Two major pieces of NASA's deep-space exploration program — full-size replicas of the agency's new Orion space capsule and Mars rover Curiosity — will make an appearance during Obama's inaugural parade today (Jan. 21). NASA's "Mohawk Guy" Bobak Ferdowsi, a Curiosity flight director renowned for his hairstyle, will also march in the parade, and has promised a new hairdo to mark the event. Several NASA astronauts, including Michael Massimino —the agency's most followed space man on Twitter (@Astro_Mike) — will appear in the parade, too. President Barack Obama salutes as he and U.S. Senator Charles Ellis "Chuck" Schumer (D-NY) depart the White House for Capitol Hill and the swearing-in of Obama as the nation's 44th President, Monday, Jan. 21, 2013, in Washington, DC. In his first term as president, Obama canceled NASA's moon-oriented Constellation program and directed the space agency to pursue a new vision of deep-space exploration, a program that aims to send the first manned mission to an asteroid by 2025. By the mid-2030s, the target is Mars. At the same time, NASA was busy developing a new spacecraft for deep-space exploration, the Orion space capsule, as well as a giant rocket called the Space Launch System to boost the capsule off the planet. The agency is developing another craft, the Space Exploration Vehicle, designed to make the trip to a near-Earth asteroid or other deep-space destination. Construction has already begun on NASA's first Orion space capsule to fly and will continue throughout this year. That prototype is expected to launch unmanned atop an existing Delta 4 Heavy rocket in 2014 for an initial test. 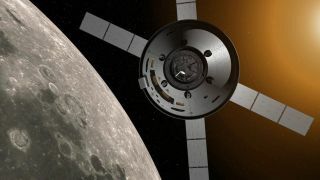 A more ambitious unmanned test flight around the moon is planned for 2017, when an Orion capsule will make an unmanned trip around the moon after launching on the first Space Launch System booster. Last week, NASA finalized a deal with the European Space Agency on the Orion capsule's service module, which will provide power, propulsion and other vital systems for the space capsule beginning with the 2017 test flight. The move, NASA officials said, sets the stage for a true international approach to space exploration beyond low-Earth orbit. "Space has long been a frontier for international cooperation as we explore," Dan Dumbacher, NASA's deputy associate administrator for Exploration System Development, said in a Jan. 16 statement. "This latest chapter builds on NASA's excellent relationship with ESA as a partner in the International Space Station, and helps us move forward in our plans to send humans farther into space than we’ve ever been before." In addition to exploring a near-Earth asteroid and Mars, NASA is also eyeing a potential plan to build a deep-space station on the far side of the moon that could serve as a stepping stone to the asteroid or Mars flights. While NASA works on new spacecraft for deep-space missions, the agency is also supporting the development of new private manned spaceflight vehicles that could ferry American astronauts into and from low-Earth orbit. NASA hopes the commercial spacecraft will be ready by 2017. Until then, the space agency is dependent on Russia's Soyuz spacecraft for flying Americans into orbit. NASA already has billion-dollar deals with two private companies, SpaceX of Hawthorne, Calif., and Orbital Sciences Corp., in Virginia, to provide commercial cargo deliveries to the International Space Station aboard robotic spacecraft. Last year, SpaceX flew two missions to the space station using its Falcon 9 rockets and Dragon spacecraft, and plans to launch its third flight sometime in March under a $1.6 billion contract for 12 missions. Orbital Sciences is planning to launch the first test flights of its Antares rocket and Cygnus space capsule later this year as part of a $1.9 billion contract for eight missions. In December, NASA awarded a total of $30 million in funding to three different private spaceflight companies to support their work on new commercial spaceships. SpaceX, aerospace veteran Boeing and Sierra Nevada Corp. received different amounts of the funding package to spur their individual projects. SpaceX is working to scale up its Dragon capsule to carry seven astronauts on roundtrip orbital flights. Boeing, too, is working on a space capsule (called Commercial Space Transportation 100), while Sierra Nevada is developing a small space plane dubbed Dream Chaser for its entry. A fourth contender, the company Blue Origin founded by billionaire Amazon CEO Jeff Bezos, is also competing for NASA funding. NASA provided an update on the four companies' projects last week, with each firm promising big steps forward for their space vehicles in 2013. "I think the partnership between NASA and each of these companies clearly shows that we have a very vibrant space industry in the United States," said Ed Mango, NASA's manager for the commercial crew program. "The four companies here today are capable and are the leading edge of what it takes to get folks back into low-Earth orbit over time."